(California?) 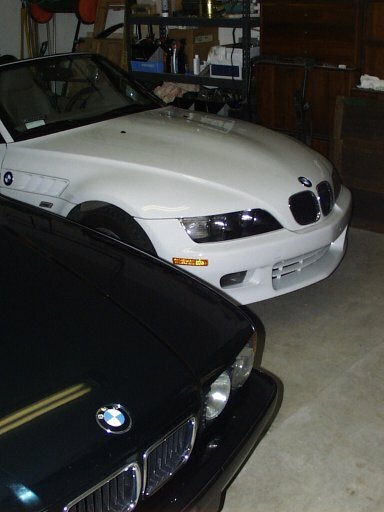 I saw your posting on the Z3 message board (bimmer.org) and really got a kick over the pages you've assembled... both the "Z3 Girls" and the "Z3 Garages". 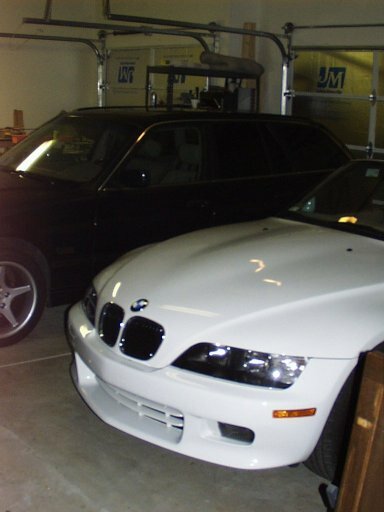 My 2000 Z3 2.8 shares a garage with my first bimmer, a 95 525iT. Both cars seem to get along well, at least there've been no slap fights so far. They both think that they're my favorite. The 3rd stall at the far end is occupied by various pieces of woodworking equipment... I tend to move the cars outside when I'm making sawdust. Also, the 3rd tail-light on my roadster as a clear bezel, but most others I've seen has the usual red... the LEDs or whatever are red. Any idea what the deal is? The Z3 is a 'factory car'... pre-owned by someone at BMW... in fact, I found a wad of ATM slips behind the driver's seat, all from South Carolina. Anyway, I suppose the previous 'owner' might've had a clear lens installed. 95 525iT - um, cd-changer and that's about it! 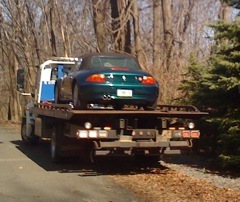 00 Z3 2.8 - heated leather sport seats, power top, in-dash CD advanced OBC, 5-speed.